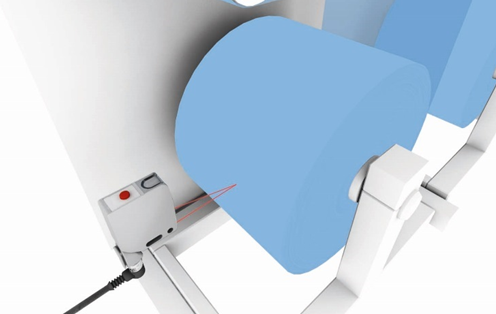 Photoelectric sensors have been around for a long time and have made huge advancements in technology since the 1970’s. We have gone from incandescent bulbs to modulated LED’s in red light, infrared and laser outputs. Today we have multiple sensing modes like through-beam, diffuse, background suppression, retroreflective, luminescence, distance measuring and the list goes on and on. 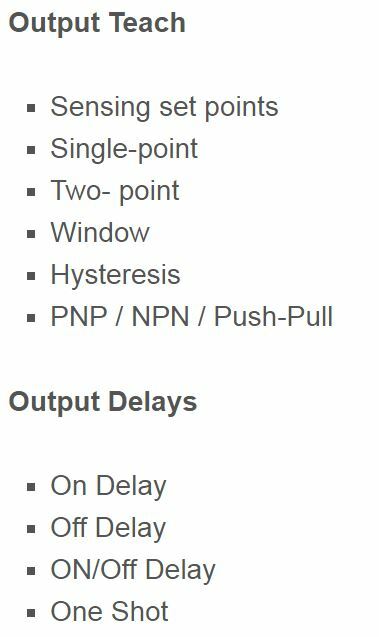 The outputs of the sensors have made leaps from relays to PNP, NPN, PNP/NPN, analog, push/pull, triac, to having timers and counters and now they can communicate on networks. 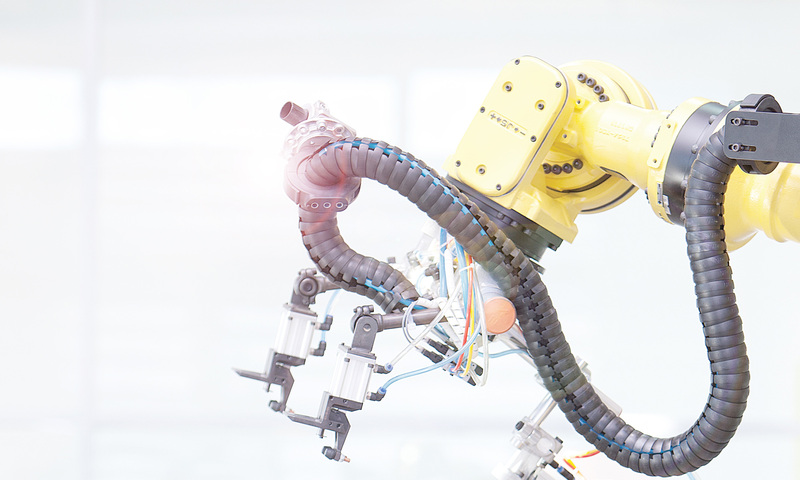 The ability of the sensor to communicate on a network such as IO-Link is now enabling sensors to be smarter and provide more and more information. The information provided can tell us the health of the sensor, for example, whether it needs re-alignment to provide us better diagnostics information to make troubleshooting faster thus reducing downtimes. 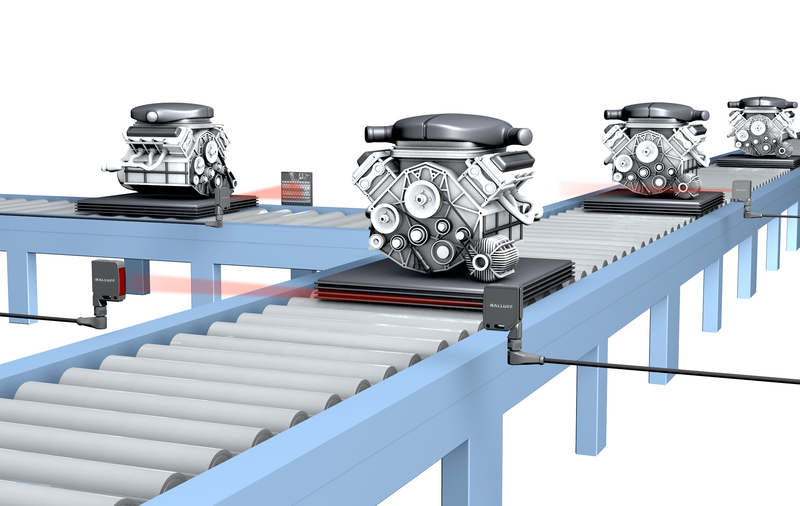 In addition, we can now distribute I/O over longer distances and configure just the right amount of IO in the required space on the machine reducing installation time. IO-Link networks enable quick error free replacement of sensors that have failed or have been damaged. If a sensor fails, the network has the ability to download the operating parameters to the sensor without the need of a programming device. With all of these advancements in sensor technology why do we still have different sensors for each sensing mode? Why can’t we have one sensor with one part number that would be completely configurable? 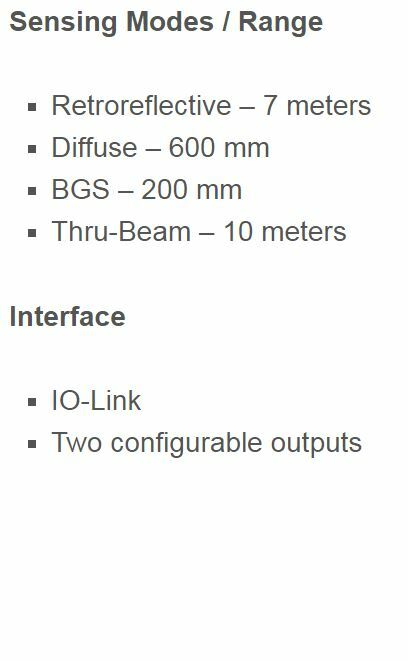 Just think of the possibilities of a single part number that could be configured for any of the basic sensing modes of through-beam, retroreflective, background suppression and diffuse. To be able to go from 30 or more part numbers to one part would save OEM’s end users a tremendous amount of money in spares. To be able to change the sensing mode on the fly and download the required parameters for a changing process or format change. Even the ability to teach the sensing switch points on the fly, change the hysteresis, have variable counter and time delays. 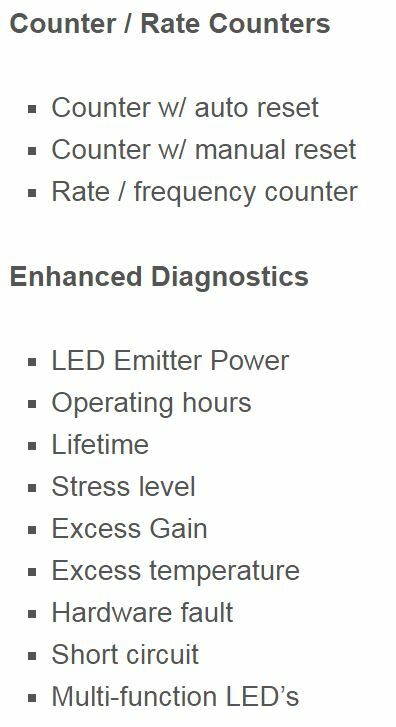 Just imagine the ability to get more advanced diagnostics like stress level (I would like that myself), lifetime, operating hours, LED power and so much more. Obviously we could not have one sensor part number with all of the different light sources but to have a sensor with a light source that could be completely configurable would be phenomenal. Just think of the applications. Just think outside the box. Just imagine the possibilities. Let us know what your thoughts are. 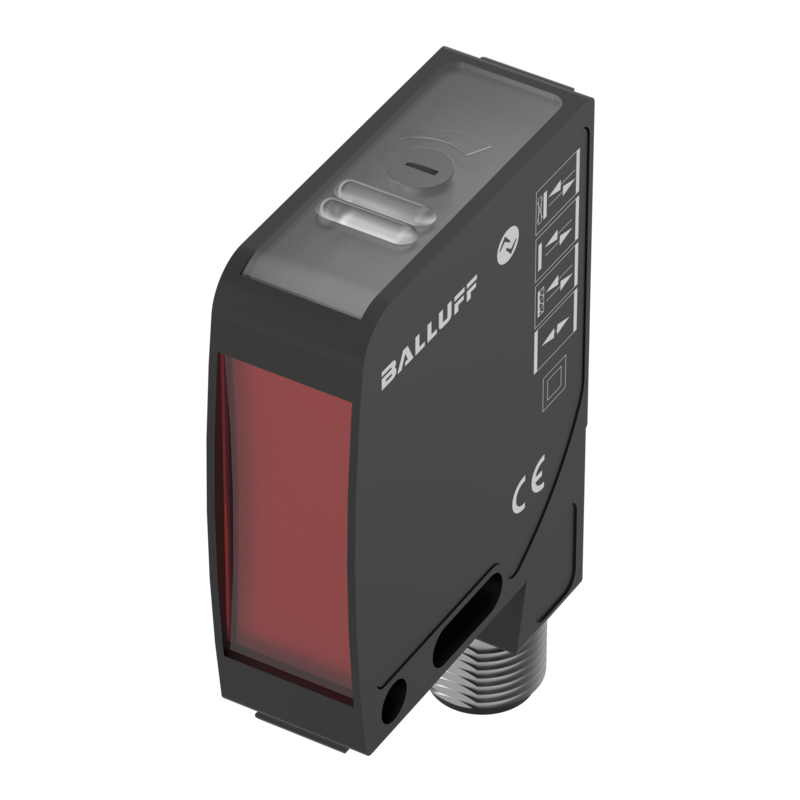 To learn more about photoelectric sensors, visit www.balluff.com. 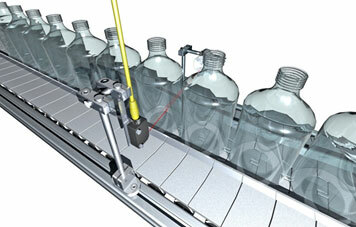 Photoelectric sensors are used in a wide variety of applications that you encounter every day. They are offered in numerous housing styles that provide long distance non-contact detection of many different types of objects or targets. Being used in such a variety of applications, there are several outputs offered to make integration to control systems easy and depending on the sensing mode when the output is activated in the presence of the target. Diffuse sensors depend on the amount of light reflected back to the receiver to actuate the output. Therefore, Light-on (normally open) operate refers to the switching of the output when the amount of light striking the receiver is sufficient, object is present. Likewise, Dark-on (normally closed) operate would refer to the target being absent or no light being reflected back to the receiver. Retroreflective and through-beam sensors are similar in the fact they depend on the target interrupting the light beam being reflected back to the receiver. When an object interrupts the light beam, preventing the light from reaching the receiver, the output will energize which is referred to as Dark-on (normally open) operate switching mode or normally open. Light-on (normally closed) operate switching mode or normally closed output in a reflex sensor is true when the object is not blocking the light beam. 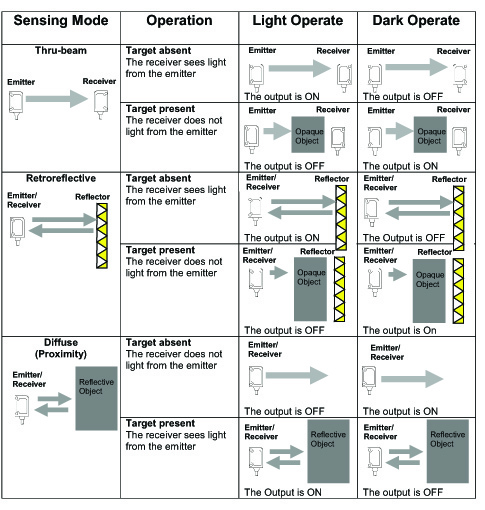 Outputs from photoelectric sensors are typically either digital or analog. 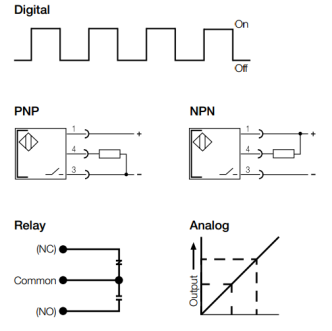 Digital outputs are on or off and are usually three wire PNP (sourcing output) or NPN (sinking outputs). The exception to this is a relay output that provides a dry or isolated contact requiring voltage being applied to one pole. Analog outputs provide a dynamic or continuous output that varies either a voltage (0-10 volt) or current (4-20mA) throughout the sensing range. Voltage outputs are easier to integrate into control systems and typically have more interface options. The downside to a voltage output is it should not be ran more than 50 feet. Current outputs can be ran very long lengths without worry of electrical noise. As additional advantage of the analog output is that it has built in diagnostics, at its minimum there will always be some current at the input unless the device completely fails or the wire is damaged. Some specialty photoelectric sensors will provide a serial or network communication output for communications to higher level devices. Depending on the network, IO Link, for instance, additional diagnostics can be provided or even parameterization of the sensors. Interested in learning more about photoelectrics basics? You can also request a copy of the new Photoelectric Handbook. Recently I was asked if light on and dark on for a photoelectric sensor was the same as normally open and normally closed. The short answer is yes, but I think it justifies more of an explanation. In the world of proximity sensors, capacitive sensors, and mechanical switches when the target is present the output changes state and turns on or turns off; there is no ambiguity. 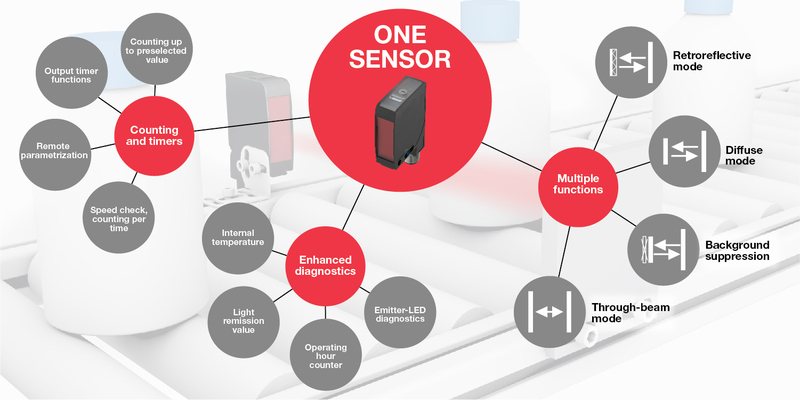 With photoelectric sensors, instead of normally open or normally closed we refer to light-on operate or dark-on operate because we are referring to the presence or absence of light at the sensor’s receiver. The output of a light-on operate sensor is on (enabled, high, true) when there is sufficient light on the receiver of the sensor. Conversely, the output of a dark-on operate sensor is on when the light source is blocked or no light can reach the receiver. There are three modes of operation with photoelectrics: diffuse, retro-reflective, and through-beam; and the sensing mode determines if the sensor is normally light-on or dark-on. Retro-reflective and through-beam sensors function as light-on operate sensors because under normal operating conditions there is a reflector or a light emitter providing a light beam back to the sensor receiver. If no object is blocking the light beam to receiver the output is on, normally closed. If the target or object is in between the reflector or emitter then the light beam can no longer reach the receiver causing the output to turn off. Since the diffuse mode of operation requires the target or object to reflect the light source back to the receiver, it functions as a dark-on operate, normally open. If no object or target is placed in front of the sensor, no light will be reflected back to the receiver. When the object is present, the output changes state from normally open to closed. Choose The Flavor Of Photo Eye: Light-On Or Dark-On? Sometimes the things that seem the simple can be the most confusing. In the world of the photo sensor, the principle of “light-on” vs. “dark-on” is one of these things. What am I talking about you might ask? Let’s see if I can help define these concepts. 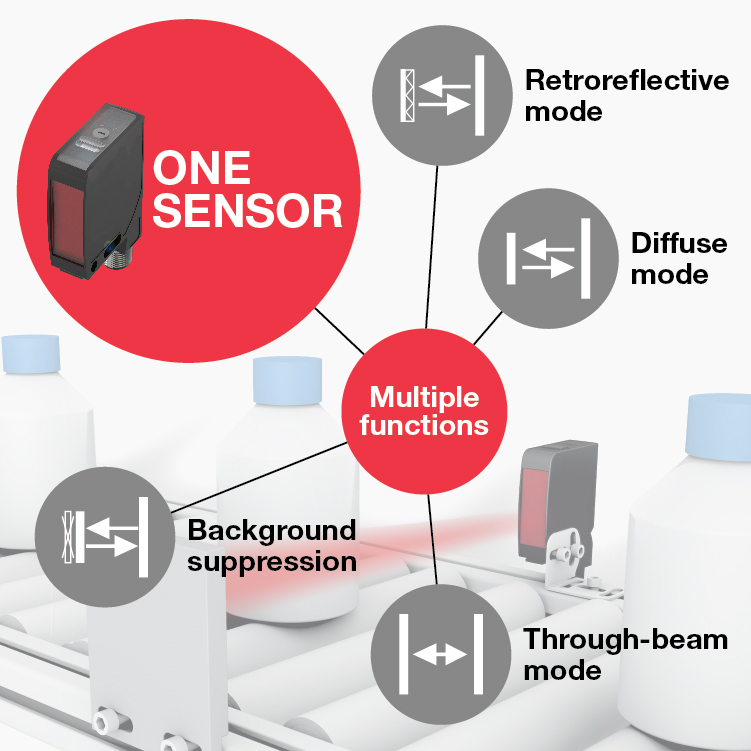 The most popular photoelectric sensor used is the retro-reflective or reflex mode sensor. One of the advantages of the retroreflective style photoelectric sensors is the light emitter, or light source, and the receiver are in the same enclosure, thus you only have a single device to mount and wire making installation easier and faster. The output of the sensor changes state when the object blocks the light beam between the sensor and the reflector.